The result against Stoke was something that only happens once every six or seven years and deserves to live long in the memory. However, it should be apparent to everyone around the club that it should only be the second-biggest achievement this season if everything goes to plan, starting with three points away this weekend at our direct promotion rivals, Exeter City. For Mark Robins, the task is to ensure that we can take the momentum that comes with beating a Premier League side but avoid the ‘after the Lord Mayor’s show’ that can happen in the game after a big result. Inconsistency has prevented us from establishing ourselves more firmly in the promotion race and now that we’ve played ourselves back into a prime position, it has to be avoided at all costs. Since the win over Cheltenham in the middle of December, the team has settled into a nice balance. Chris Stokes and Tom Davies have stepped into the defence ably at left-back and centre-back respectively, Tom Bayliss has been a revelation in midfield, adding the drive and dynamism we lacked with the Michael Doyle-Liam Kelly partnership, while Marc McNulty’s form has ultimately been the biggest factor in our run of three league wins out of four. 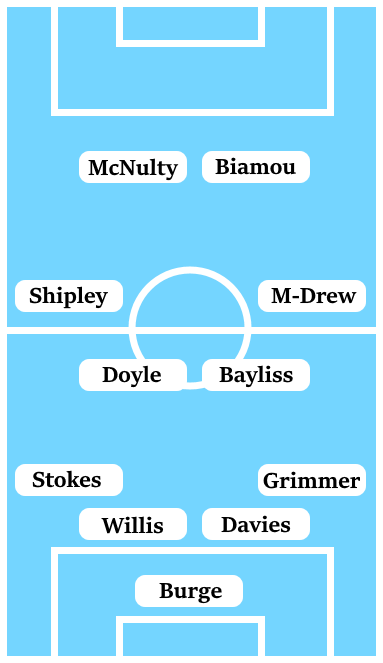 Aside from restoring Lee Burge in goal, Mark Robins should have little temptation to change what is a functioning side. It’s only the additions to the squad of Jordan Maguire-Drew and Josh Barrett that change the equation somewhat, but Maguire-Drew put in a strong performance as a Jodi Jones replacement on his debut, while there’s a need to have at least one game-changer on the bench now that Duckens Nazon has left, which time will prove whether Josh Barrett can fit the bill. Our last meeting with Exeter saw us produce our best performance of the season at that point. With our opponents the then-league leaders having started the season in scintillating form, we managed to completely nullify almost all attacking threat they posed. A pre-game injury to Stuart Beavon and an in-game one suffered by Peter Vincenti forced Mark Robins into a makeshift front four of Jodi Jones, Devon Kelly-Evans, Duckens Nazon and Maxime Biamou, who clicked almost immediately. We went ahead early in the second-half after Exeter’s Troy Brown diverted a Jodi Jones cross into his own net. Jones then carried the ball forward on the counter later in the second-half before setting Devon Kelly-Evans up for his first and, thus far, only goal for the club. While Exeter remain around the play-off places – and with a game in hand – there’s been the sense that things have not been quite the same since that game back in September against us. It coincided with a long-term injury to key centre-back Jordan Moore-Taylor and star striker Reuben Reid losing his goalscoring form – he has since been sold to Forest Green Rovers. Of the two factors, the loss of Moore-Taylor has been more keenly felt as the defender gave Exeter better defensive stability and composure, currently, the less-mobile pairing of Danny Seaborne and Troy Archibald-Henville have come unstuck at times. Reid’s loss of form though has been absorbed by that of Jayden Stockley in attack, a striker who provides more of an all-round threat with his physicality and hold-up play than Reid did. Paul Tisdale though will still have to adjust to losing Reuben Reid as a forward option will be key over the coming weeks and months. Against West Brom in the cup, he went for a 4-1-4-1 which left Jayden Stockley isolated, but switched to a 4-4-2 diamond, which gave them more attacking threat but left space in the middle of the park. Pace has been a key missing ingredient in this Exeter side this season, which probably helps explain why their away form has been so poor (15th in the division) versus their home form (3rd in the division). Wingers Jake Taylor and Lee Holmes are no slouches, but lack a level of explosiveness to their games. Exeter other forward options such as Ryan Harley, Hiram Boateng and Liam McAlinden look to be useful players but can lack an end product at times. In goal, Exeter have two very good options for this level in young academy product Christy Pym and the more experienced Paul Jones who has just returned to the club on loan from Norwich. Tisdale was known to rotate his goalkeepers last season depending on who he saw as more suited to each game, and it wouldn’t be a surprise for current first-choice Pym to drop out of the side. It has been a characteristic of us this season to produce our best performances against the better teams, which I suppose has been evidenced by the win over Stoke. Despite Exeter’s impressive home form this season, this is a game that doesn’t hold as much fear for us as it would a lot of other teams in this division. However, it would be typical of us this season too to produce a dull, spluttering performance now that we’ve given ourselves a chance to assert our position in the automatic promotion race. Against my pessimistic instincts, I think we’ll win this game, 1-0.